Q: What is the purpose of having emotions? Imagine putting your face in a pile of rubbish. What did you feel? Does it seem like a good idea? Imagine eating your favourite food? What does that feel like? Does it seem like a good idea? Emotions give us a quick ‘gut feeling’ about whether something is a good or bad idea. At a very basic level they tell us something is worth approaching or avoiding. This really matters in a problem like depression. Put simply, when we are depressed our emotions are telling us that nothing is important. We feel tired, hopeless, and any activity can seem pointless. 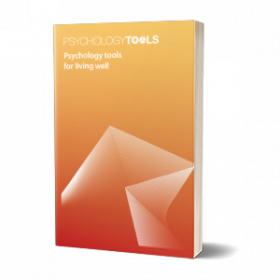 The problem is that if we feel that nothing is important we do less, and then fewer good things happen to us, which can in turn make us feel even worse. Emotions also matter in problems like anxiety. With anxiety our emotions are telling us that something is frightening, so we tend to avoid it. But avoidance tends to come with consequences too: and often these unintentionally keep our anxiety going. 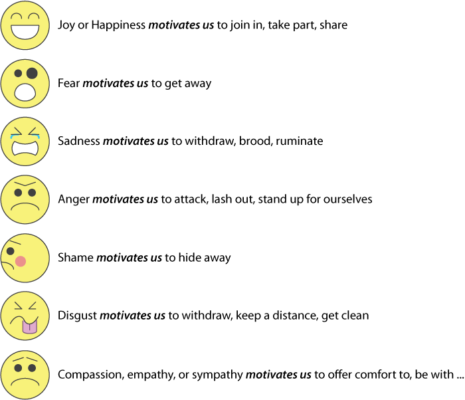 There is no such thing as a ‘good’ or ‘bad’ emotion – they all serve a purpose. We might like or dislike certain emotions, though, especially if they come at inappropriate times. As human beings we don’t just feel emotions in our heads, we feel them with our bodies too. 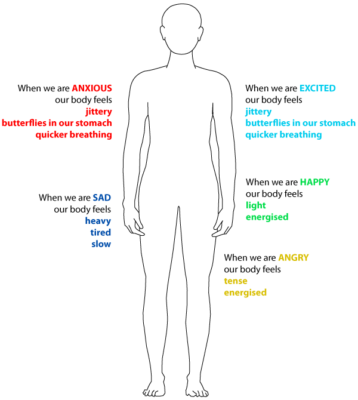 One research study asked over 700 people to rate where in their body they felt different emotions.